Click the banner to hear recent radio reviews. IssuesEtc where Christianity meets culture. Run Time: 112 min, Rated PG (Canada) PG-13 (MPAA) for sequences of intense sci-fi action and violence, and some suggestive content. Thor: The Dark World is a fast-paced, sci-fi fantasy, comic book film with a strong sense of joy even in the face of danger and trouble. There is no dark hand-wringing here, nothing particularly dour. While Thor as a character has Batman's passion and determination he is not needlessly grim. This is one of the film’s strengths. 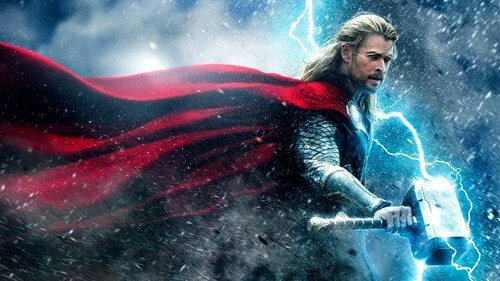 A movie centred loosely on Thor the 'god of thunder' from Norse mythology would be unbearable if taken too seriously. That said, for all of Thor's light-hearted fun and remarkable comedic timing, it's Chris Hemsworth's (Rush 2013) ability to bring some emotional depth to this potentially shallow character that makes the film shine. Even though Tom Hiddleston as Loki (Thor's adopted brother) eats up the scenery and steals the show at times, it's really Chris Hemsworth who holds Thor: The Dark World together. The first Thor movie, Thor (2012) introduced the central characters from this corner of the Marvel universe. The film was more intimate, set on a smaller stage, and therefore could focus more keenly on character development. 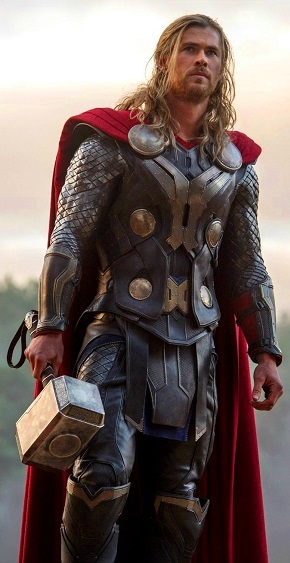 Thor: The Dark World takes advantage of this previous character development, along with Thor and Loki's appearances in The Avengers (2013), to jump right into the action. Having each central character already sketched out is used to great economy, but this approach falls down with the introduction of the new villain, a dark elf named Malekith (Christopher Eccleston). He receives very little introduction and nearly no character development which is unfortunate because Eccleston is a very good character actor and would have brought a lot to whatever he was given. The director, Alan Taylor, better known for his TV work on such shows as Game of Thrones, Mad Men,andThe Sopranos, has his hands full with this epic film and does well. However, Thor: The Dark World suffers for not having the franchise's previous director, Kenneth Branagh at the helm. Part of the first film’s fun was Branagh’s ability to infuse a gravitas that bounced back and forth between Shakespearian comedy and tragedy. In this department Taylor lacks Branagh's finesse. A good example is Anthony Hopkins' performance as Odin (Thor's father and Loki's adopted father), which was much better in the first film. 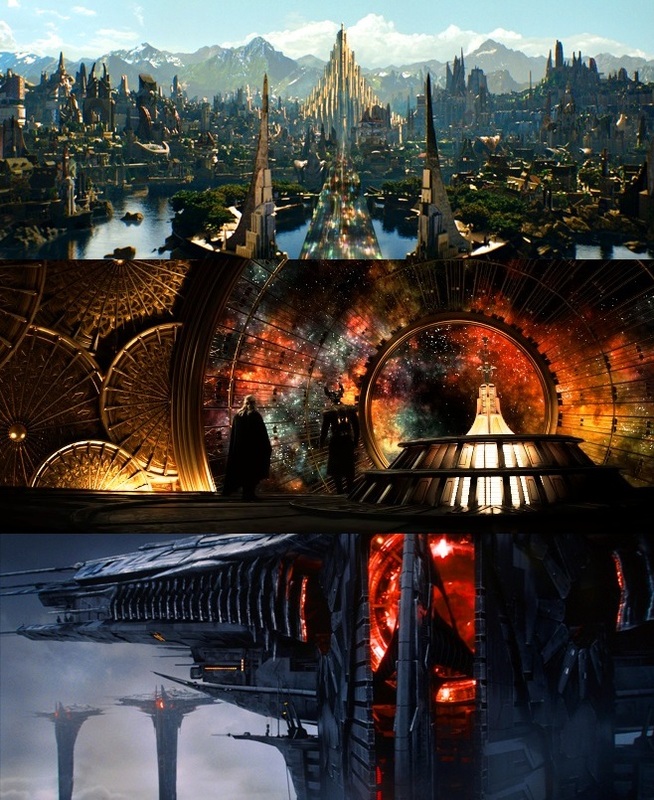 These are small points however because Thor: The Dark Worldis very good and very enjoyable. What is the story of this film? In the film’s trailer the voice of Odin (The Allfather) says, "Some believe that before the universe, there was nothing. They're wrong. There was darkness... and it has survived." This statement sets the stage for the film. Within the grand story told here—before creation there were things lurking in the dark—the movie’s villain, Malekith, was one of those “things.” Malekith needs a mysterious ‘McGuffin,’the Aether, to plunge everything back into darkness at just the right moment. The Aether was cleverly hidden away by Odin's father and its discovery sets into motion the events of the film hurtling everything towards an epic showdown between the forces of light and darkness. 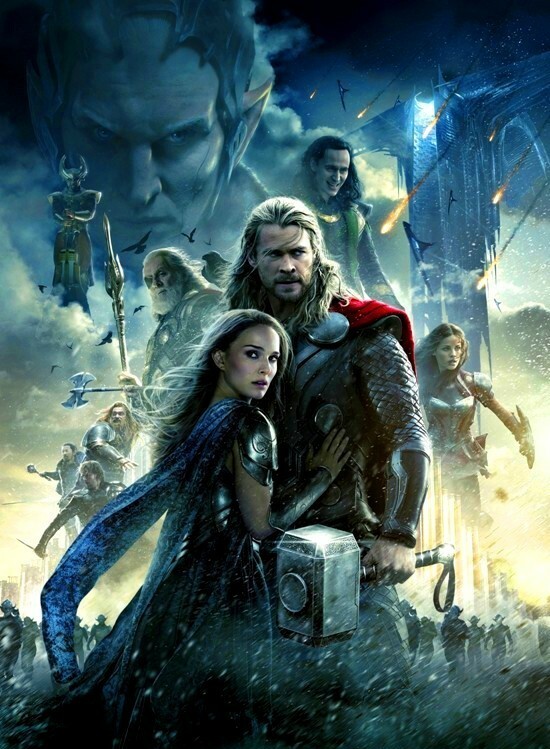 Thor's human love interest, Jane Foster(Natalie Portman), finds herself smack dab in the middle of this unfolding story and Thor's growing love for her becomes the catalyst for his final decision concerning the kingship of Asgard. The first film was about Thor's temperament and suitability to take on the kingship of Asgard from his father Odin. Deep in the background of this second film Thor is struggling with the wisdom of taking on the kingship. Can he rule as his father Odin does? This struggle is centred on Thor's relationship with his mother Frigga(Rene Russo) and Jane Foster. What is the Christian viewer to make of a film like Thor:The Dark World? One person asked, "Isn't that Thor movie a pagan thing?" Yes, Thor, Odin, Loki and the others are all part of the pantheon of Norse gods in Norse mythology, and yes, that is pagan. But the Thor of Marvel and the Thor of Norse mythology are different. All of the film’s (and comic book’s) characters are highly fictionalised departures from their pagan origins. Within the Marvel comic book world Thor has a gentle and loving side and strives toward virtues like humility and patience. The Thor of Norse mythology is more brutal and less introspective. Viewing Thor:The Dark Worlddoesn't give you a deeper knowledge of the pagan god Thor. Plus, Norse mythology doesn't include spaceships and energy weapons. The thing for Christians to notice in this film (and in all the Marvel Super Hero films) is something called ‘metanarrative’—the big story into which all other stories fit; a grand narrative that systematically explains everything, a narrative to which everything can be tied. The Bible has a metanarrative: eternity, creation, the fall into sin, promise of restoration, God's work of salvation, resurrection on the Last Day, final judgment followed by eternity. Within this narrative there is the Holy Trinity (Father, Son and Holy Spirit) and everything and everyone with whom the Holy Trinity interacts both inside and outside of time. There is also good and evil and resolution to the battle between the two found at the crucifixion of Jesus the Christ who is the Son of God. Christians are personally plugged into this metanarrative: the work of salvation history is work done by Christ for us even if we were not there to witness it when it happened. Over the last hundred years or so, particularly in the university setting, people have struggledwith the Christian metanarrative as found in the Bible, seeking to replace it with something else, often a materialist metanarrative that doesn't include things like the supernatural, God, or history as outlined in Scripture. Yet despite their efforts the metanarrative of Scripture still resonates with many people. The genres of sci-fi, sci-fi fantasy, and fantasy are particularly obsessed with the idea of metanarrative. Everything from the Wizard of Oz to Star Wars to the Lord of the Rings to the Marvel universe has a metanarrative of its own often borrowing heavily from the Christian metanarrative. Christians confess their metanarrative week-in and week-out in the Creeds of the Church and believe firmly these are not fictional stories but are in fact truth—truth in the way that makes the postmodernist's skin itch. As a result, a movie like Thor: the Dark World, which has its own metanarrative, becomes a good jumping off point to talk about the one and only metanarrative that actually matters—the Christian one found in Holy Scripture. So when Odin says, "Some believe that before the universe, there was nothing. They're wrong. There was darkness... and it has survived," the Christian says the Bible (which is Truth) states that the beginning was like this: "In the beginning was the Word, and the Word was with God, and the Word was God. He was in the beginning with God. All things were made through Him, and without Him was not any thing made that was made. In Him was life, and the life was the light of men. The light shines in the darkness, and the darkness has not overcome it." Jesus Christ is the Word of God. Christians can say that Thor: The Dark World is fiction. There was no Malekith, Aether, Odin, Thor, or Loki.We can remind others that the first book of the Bible starts with these words, "In the beginning, God created the heavens and the earth. The earth was without form and void, and darkness was over the face of the deep. And the Spirit of God was hovering over the face of the waters. And God said, “Let there be light,” and there was light. And God saw that the light was good. And God separated the light from the darkness. God called the light Day, and the darkness He called Night. And there was evening and there was morning, the first day." Is it taking things too seriously to put such a fine point on this? Probably not. Postmodernism as a worldview often sets out to say that Scripture is just another story like the Norse mythology upon which Thor is loosely based and that the Bible is just another story like the story spun by the writers at Marvel. Christians will say otherwise while, in their Christian freedom, enjoying a good fictional story when presented to them.With this in mind, if contemplating the deep meaning of metanarrative is appealing, Thor: The Dark World gives just enough to keep such contemplation percolating. On the other hand, if high adventure and genuine fun is desired then Thor has that in spades. Thor: The Dark World is an unusually strong sequel and a good addition to the Marvel super hero movie franchise and it manages to grasp the weirdness of the original comic book while doing what comic books do best: interweaving plots and characters while building a big picture story. "MacGuffin (a.k.a. McGuffin or maguffin) is a term for a motivating element in a story that is used to drive the plot. It actually serves no further purpose. It won't pop up again later, it won't explain the ending, it won't actually do anything except possibly distract you while you try to figure out its significance. In some cases, it won't even be shown. It is usually a mysterious package/artifact/superweapon that everyone in the story is chasing." In Thor: The Dark World, the Aetheras as a McGuffin is less like the Maltese Falcon in The Maltese Falcon (1941), and more like the Ark of the Covenant in Raiders of the Lost Ark (1981). Apostles' Creed, Nicene Creed and the Athanasian Creed. People have listed their religion on official census forms as Jedi.